My friend Island Vittles has decided to start a series on that worldwide known Japanese specialty that is “Yakitori/焼き鳥/”Grilled Chicken”. I hope that this series of postings on various basic recipes will help her and all other foodies interested in that simple, healthy and so delicious delicacy! “Sasami/ささ身 or 笹身” may be roughly translated as “white light chicken meat”. 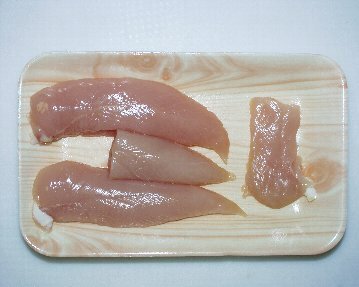 It is found in the breast (see picture above) and is considered the most tender part of the chicken. “Sasami” as sold in Japanese supermarkets. 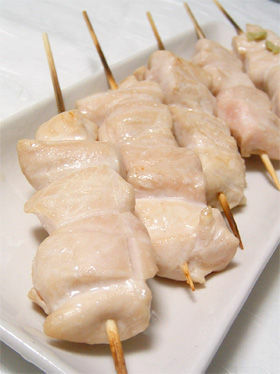 -Cut each sasami into 4~6 pieces for each skewer. Drop all the cut chicken in a bowl and add just enough sake for seasoning/marinating. Add chicken soup stock powder and mix well by hand. Drain chicken (throw away the “juices) with a sieve or “Zaru” (Japanese bamboo sieve). Transfer into clean bowl and add enough sesame oil to season the whole. Stir with hand for even seasoning. Don’t overgrill. No “black spots” should appear. Best served with real wasabi. You may of course serve them with a little salt, or pepper or whatever you fancy. Have lettuce handy for a great and simple combination. For foodies of all ages! -Cut the sasami into bite-sized chunks and salt lightly. -Fry the chicken chunks in a non-stick pan over a medium fire. -Once the the chicken is cooked (do not overcook it! No “black spots”) should appear! 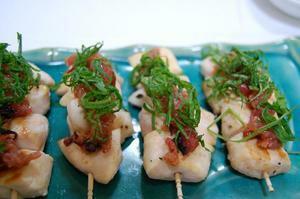 ), align them on skewers. Mince the umeboshi flesh with a knife and paste it along the Top. Chop the shiso leaves finely and decorate as shown on top picture. -makes for an easy, cheap and elegant snack!